The 2012 - 2013 Winter Season is OVAH! Mitten High Fives Canada! Well it is that time of year again! Sure there is still snow on the ground in some parts of the country, and Alert, top of Canada is COLD as heck, but it is time for us to bid you adieu for the non winter season! A quick glance at our records show that we started tweeting back in SEPTEMBER, to it's been a lonnnnng winter! We have to give a big thanks to everyone who made this Winter Season so amazing! We had a lot of wonderful things happen! We darn near doubled our Twitter Followers, made some new friends on Facebook. We also got to talk to some of our pals at Various CBC's and Featured on the Weather Network . Not only that, we had a wonderful fan knit us some Mittens! Congratulations to Jenny and Sudbury and Erin from Edmonton! We will have your mittens in the mail soon! The 2013 - 2014 Winter Season will be here before we all know it and we already have some changes planned! Re-vamped website for sure, and some other secret secret ideas! 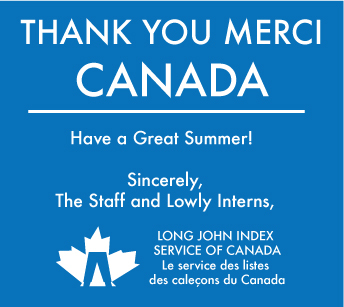 On behalf of everyone here at the Long John Index, thank you for all your Tweets, Toque Purchases, Facebook Comments and Emails. It's great to be a part of a community of wacky weather nerds.